Poker, but you're a frog! And a cowboy... err, cowfrog? Either way, put on your favorite western saloon music and try your hand at Croaker, frog poker in the West! 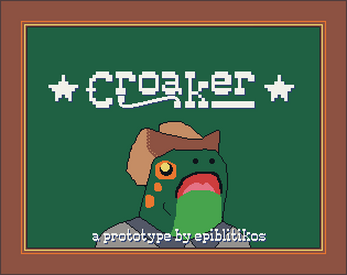 I originally wanted to make this game for Mini Jam 16, which was western-themed with the limitation of "your game must include a frog." Life got mad-busy that weekend, but I couldn't let go of the idea--hence this game! It's 5-card draw poker, and clicking does everything. In the first part of the hand, click cards you don't want to mark them for discard, then click the big blue discard button. If you see a fold button, that's because Cam has raised the stakes--decide if you want to call or even raise! Continue betting after the draw if you like your odds, and finally click the big button again to see who wins the hand! There's a few surprises in here, so pay attention. Cam's poker face isn't so good. This game was made in a bit over a week, from Jan 27 to Feb 4, 2019.